Soil preparation is essential for growing carrots. This vegetable prefers a light soil that's not to stony, get this right and they are easy to grow and care for. 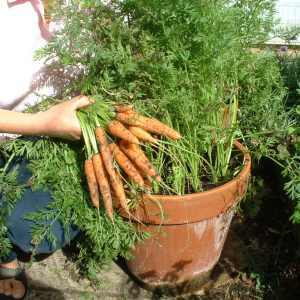 Once you know how to grow carrots everybody in the family will enjoy this all-round vegetable. Rich in vitamin A and Calcium and an excellent source of fibre for you and your family, carrots are delicious eaten raw, boiled, steamed and even roasted. Growing carrots have one dangerous enemy though...so make sure you read all about the carrot fly later in this article. Carrots grow best in full sun but will tolerate some shade. Growing carrots in a heavy soil and one that is stony will cause the carrot roots to become deformed... some of these shapes will certainly make you smile and even blush! A deeply dug, light sandy soil is best for harvesting the longer varieties. If it is heavy or stony grow the more stumpy varieties of carrot. Try not to plant carrots into soil that has had compost recently dug into it (last 12 months) as this can cause the carrot roots to become deformed also. To lighten the soil add peat. Start getting the bed ready two weeks before sowing the carrot seed. Break down the surface to a fine tilth and rake in a general fertilizer. Don't despair if your ground doesn't suit growing these vegetables or you just don't have the space or a garden. 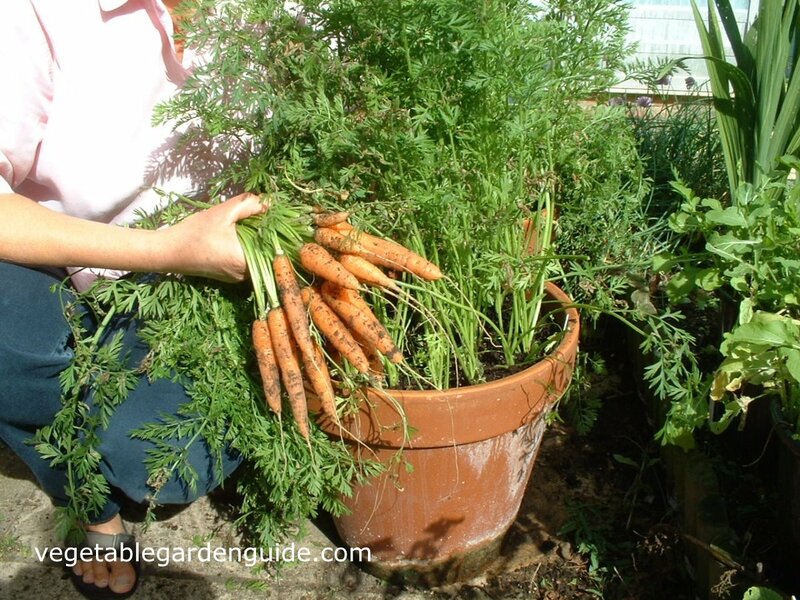 Learn how to grow carrots in pots or containers - use compost purchased from a garden center and enjoy experimenting with different varieties - you will surprise yourself as to just how much you can grow this way. You will get an idea from the photos above just how much can be harvested from containers. This is such an easy way to learn how to grow carrots and not at all expensive. The pots I used in this case measure 32.5cm(13") across the top and stand 30cm(12") high. The first photo shows the carrots - variety is Nelson F1 - just emerging. They were sown in a circular fashion because I like to play :0) . The second photo shows my wife Ros harvesting some of the carrots a few weeks later. Container vegetable growing with carrots has a lot going for it as the environment is so easy to manage - it's the easiest way I know for how to grow carrots. Sown over the months from mid - February to July you can be eating carrots from early June to October. Storing this vegetable correctly can increase that period even longer. Below is a list of the average sowing and harvesting dates that will act as a rough guide on how to grow carrots at the correct times in the UK. Sow mid February and protect with a cloche. Grow an early variety which you can harvest in early June. Sow March and protect with a cloche. Grow an early variety which you can harvest in June/July. Sow April - no protection necessary. If you grow an early variety expect to harvest July/August. A maincrop variety will be ready August. Sow May. Grow a maincrop variety and harvest in August. Sow June. Grow a maincrop variety and harvest in September. Sow July. Grow a maincrop variety and harvest in October. Sow carrot seed thinly into prepared beds, in rows 15cm(6") apart. Thin out the seedlings when they are large enough to handle, about 7-10cm(3-4") apart. 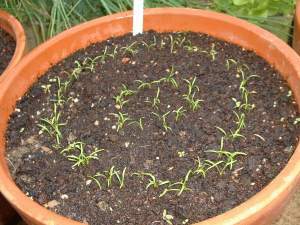 So as not to disturb the remaining carrot seedlings I use a small pair of pointed scissors and cut the stems of carrot seedlings just below the soil surface. Be aware... the dreaded carrot fly is attracted to the carrot smell, dispose of the thinnings quickly - bury, burn or put them in the rubbish bin - then earth up the carrot plants to cover any exposed root. Evening is the best time to do this. Hoe as necessary to keep down weeds but be careful when the root begins to swell not to cut into it - best to stop hoeing and pull any weeds out by hand. Splitting of the root can occur if the watering is too irregular. Water enough to keep the ground damp. Water with a liquid feed on a regular basis - carrots respond well to this. Carrot fly is this vegetables worst enemy. It is a small black fly which lays its eggs in the soil at the base of the plant. It is the small maggot that hatches from the egg that causes the damage. The tell-tale signs are reddish leaves which droop in sunny weather. As the maggot eats out the carrot root the foliage turns yellow and the root is liable to rot. Needless to say seedlings are shown no mercy and are soon killed. The fly tends to be most common in May. There is no treatment so preventive measures are your only safeguard - it is essential to learning how to grow carrots and indeed any vegetable that you get to know your enemy. Cover seedlings with a plant fleece in spring. Destroy thinnigs immediately - bury, burn or trash bin. If carrot fly infestation is bad in your area then harvest early varieties no later than August and don't sow maincrop varieties until June. Infestation seems worst on dry soils so keep the ground damp. A tip to help with your learning how to grow carrots is to remember that the carrot root fly's 'flight path' is low and in a straight line. Try erecting a low 'fence' around your carrot growing rows - about 30cm(12") high. It could be made from fleece, fine netting or similar. It's Time To Harvest Those Carrots! Your efforts for growing carrots is about to be rewarded! Start pulling these tasty and nutritious vegetables from June onwards. Use a garden fork to loosen the soil around them if necessary. If you intend to store some of your crop of carrots then October is the month for this. Lift the maincrop varieties, clean off any soil - use only undamaged carrot roots - cut the foliage back to about 12mm(1/2") above the roots crown. Using a stout box place the roots on layers of sand - making sure the carrots don't touch each other. Store in a dry place and inspect regularly to remove any that may have started to rot. They should keep until March. 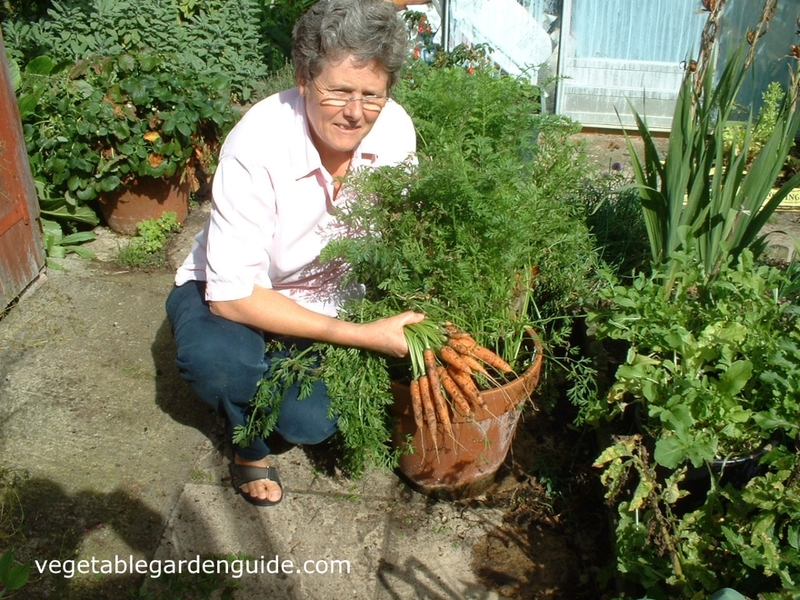 The photo above is of my wife Ros pulling some delicious pot grown carrots at the end of September 2006 - she got me experimenting so as to learn how to grow carrots in a way that overcomes this problem ie. container growing. They went with a meal she was preparing... now that is what I call fresh food. There were plenty more in other pots too, enough to last well into October... and don't forget about those important health benefits of carrots for you and your family!